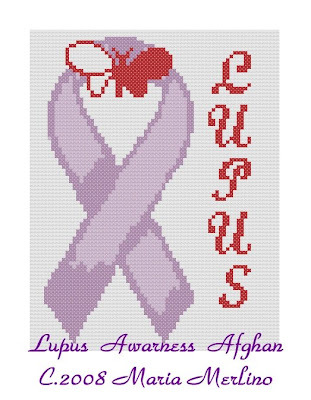 Lupus, the Latin word for wolf, is the name of a condition called systematic lupus erythmatosus or SLE. Why name a disease after a wolf, you ask? Well, in 1851, a doctor discovered red rashes on a woman's face that resembled wolf bites. 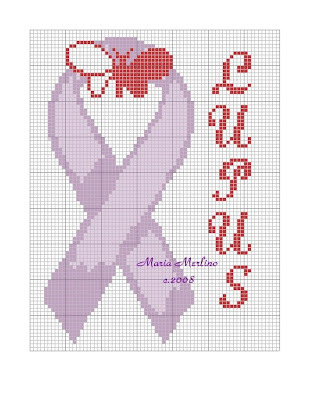 Lupus Related Items are HERE! Today we know that Lupus is a chronic inflammatory disease that occurs when your body's immune system attacks your own tissues and organs. Inflammation caused by lupus can affect many different body systems, including your joints, skin, kidneys, blood cells, heart and lungs. The face often has a rash in the tell-tale butterfly shaped mask. Lupus is treatable symptomatically mainly with corticosteroids and immuno-suppressants, though there is currently no cure. I made this for a dear friend over at Crochetville. She's a real sweetheart and suffers from this debilitating illness, but you know, she's won't let this wolf at the door get inside and stop her from crocheting!!! As with all my patterns, I retain all my copyrights. You may use this pattern for personal use only. Neither the pattern, nor the items made from it may be sold. You may not profit from my work. This chart is 70 squares across by 90 squares high. You can use sc and an H hook with your favorite worsted weight yarn, such as Red Heart Super Saver or Caron Pounder. Use a longer stitch, like the dc or extended double crochet for an afghan sized blanket. Butterfly Prayer Shawl In Filet Crochet Chart! I wanted to create a prayer shawl that symbolized change, joy, love, and metamorphosis. I chose the Butterfly. The Butterfly is a powerful symbol in myth and religion. For early Christians, it represented the soul itself. Many pre-European populations called upon the butterfly for guidance in change, temperament, and happiness. If you are going through changes or transitions in your life right now, study the butterfly to make these changes beneficial, joyful, and rewarding. Change is what life is made of and is necessary for spiritual growth, and accomplishment. I hope you enjoy making this shawl. I usually work my filet charts with the extended double crochet stitch, but since this is worked vertically, and is a narrow chart, the normal dc stitch works quite well. This is my copyrighted pattern. I reserve all rights. You may make this shawl for personal use but never for sale. The pattern may not be sold. You may not profit from my work. Open Block : dc, ch2, skip 2 sts, dc in next st. Each open block is made up of (dc, ch 2, dc). 2 open blocks = dc, ch2, dc (shared), ch 2, dc. Solid Block : 4 dc. Each solid block is made up of 4 dcs. Need Thread? All Types and Sizes Here! (counts as the first open square) *ch 2, skip 2 chs, dc in next ch*, rep between the *’s across. Turn. You will have 30 open squares. Row 3: Ch 5, (dc in the next dc, ch 2) 5 times, dc in next dc, 2 dc in next ch 2 sp, dc in next dc, 2 dc in next ch 2 sp, dc in next sp----at this point you will have 6 open squares and 2 solid squares--- *ch 2 dc in next dc*, rep between the *'s across. Turn. Row 5-130: Following chart, work remainder of chart. At this point I will let you decide how to finish the shawl. The simplest way is just to work an edging of sc around the shawl by placing 2 sc in each open square, and a sc in each dc and 5 sc in each corner. Other simple edgings are shells, picots, or reverse sc. Did you ever buy a can of Cesar's Dog Food or take a sip of Black & White Scotch? Well, the little white pooch on the label is a West Highland Terrier. This cute little dog with the over sized head has it's roots in Scotland and is related to the Cairn Terrier. The Westie is a happy-go-lucky dog, friendly with a high self-esteem, although once in a while you'll find one that is very timid or a fighter. For All Things Westie, Check This Out!!! 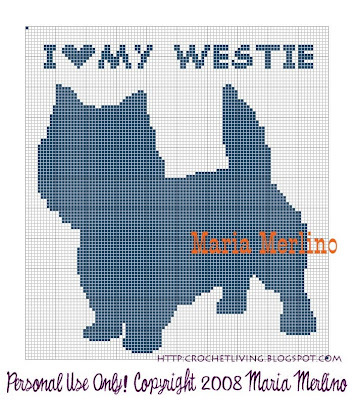 One of the gals over at Crochetville asked for a Westie graph and I obliged. The chart is 110 squares wide x 100 squares high. You can use sc and an H hook with your favorite worsted weight yarn, such as Red Heart Super Saver or Caron Pounder. Use a longer stitch, like the dc or extended double crochet for a afghan sized blanket. My charts and graphs are mine and are under my copyright. You make make items for your own personal use but never for sale. You may not sell the pattern. You may not profit from my work. 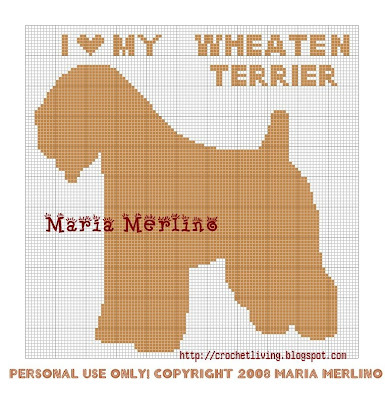 I Love My Wheaten Terrier Crochet Graph or Chart! Like Wheaton Terriers? Here are all things Wheaten! As an all purpose farm dog, the Wheaton terrier is native to Ireland. They were bred to herd, watch and guard livestock and hunt varmints. If you have allergies or asthma, this is a good breed for you as they don't trigger antigen-antibody reactions. One of my friends over at Crochetville asked to for a Wheaton graph to surprise her Wheaton loving parents. The graph is 110 squares high x 110 squares wide. You can make a nice sized square if you use an H hook and worsted weight yarn, such as Red Heart Super Saver ot Caron Pounder. For a more rectangular piece, use dc or extended double crochet. This is my copyrighted graph and I own all rights. You may make items from this chart for your own personal use but you may not sell the items or sell my graph. You may not profit from my work.